Crosspatch Valentine's puzzle. 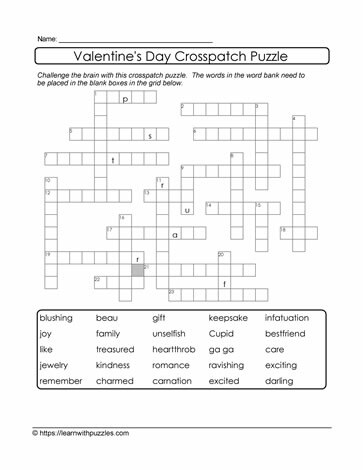 Here is a Valentine's Day printable crosspatch puzzle, suitable for students in middle school 7,8,9 grade classrooms. Puzzles activate the brain and support vocabulary building skills and engage problem solving strategies to support learning. Resources suitable for use in digital and Google classrooms, and both regular and the homeschooling environment.